Our weather is currently bizarre, with April showers, several snow showers, and teaser days for Spring. We just returned from a morning of play in Central Park with 4 of our grandchildren and while they have quiet time, I thought I would try to upload a few journal pages from one week ago. 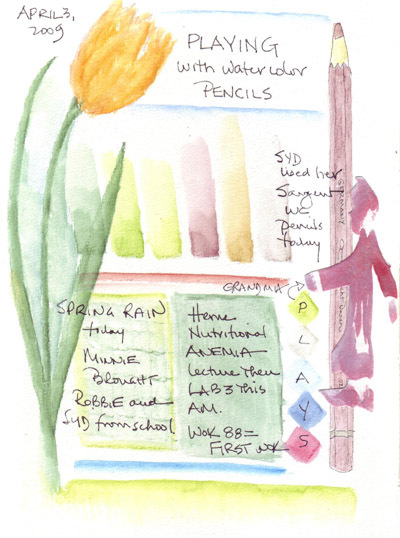 While two of my grandchildren painted and colored at our dining room table last Friday, I played with my grand daughter's Sargeant watercolor pencils - obvioulsy hoping for lots of tulips before long. The magnolia blossoms were partially open this morning and I see tulip buds in the huge beds of tulips in my neighborhood. 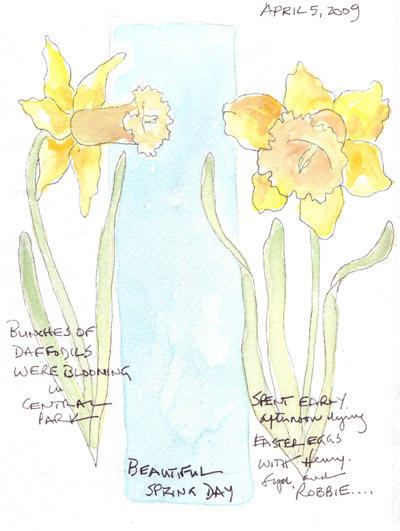 Last Sunday there were beds of daffodils blooming in Central Park - and they still looked very fresh this morning. My 2 year old grandson doesn't understand why I won't let him pick all of the pretty flowers he sees! This is ME with my Internal Critic pictured in front of my "right brain." I tried to assign a particular human form to my internal critic, but I know that it is just a piece of me that I need to deal with. I feel as if I’m fooling myself when I try to create a person to blame. My critic likes perfection and can make me unhappy every time I make mistakes. This puts emphasis on product, not process, and I have to remind myself over and over that "play" is an important component of creativity, and perfection should NOT be my goal. Mistakes are a wonderful opportunity for growth to occur. I also deal regularly with "fear of failure" and it is sometimes strong enough to keep me from trying something new. 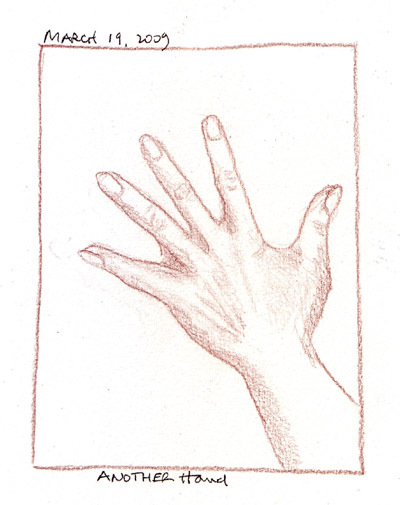 I think that working small, in a sketchbook, and everyday helps me overcome some of the doubt. But I have to really work hard to step out of my comfort zone and create tricks to get past the Internal Critic in my brain. What does my Internal Critic look like? Half of my brain? A really small part of my brain? If so, where? Maybe I should have sketched a really small person and put her on my head - as if she were in my brain. 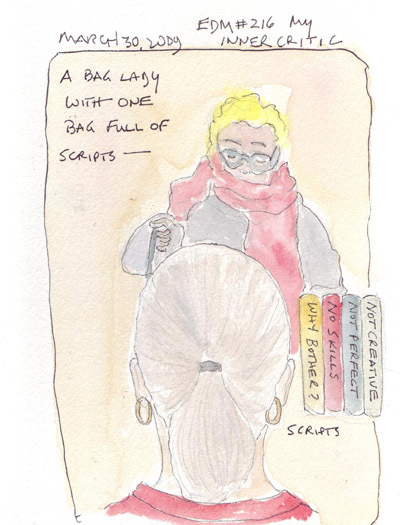 When I try to picture her, I see a "bag lady" if I see anything - someone with an incredible number of opinions but no creativity, passions, skills or products of her own - just a mouth, thick frame glasses, and a bag of scripts. The major scripts that she repeats over and over are the ones listed above. I really haven’t made much progress changing my perception of my creative abilities. I’ve read enough about creativity, the origin of creative ideas, and how to stimulate creativity - so I am developing skills to deal with my critic. And every once and a great while I do something that even I feel is original. Last week I was immersed in Khaled Hosseini's book A Thousand Splendid Suns for 2 days. 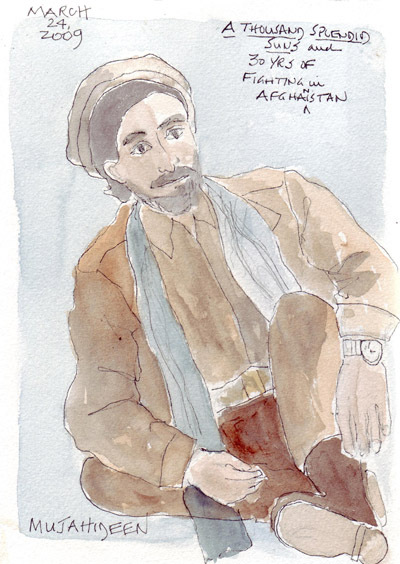 The story is set against 30 years of war in Afghanistan and when I chose my daily sketch for each day, I was inspired to look for something that would capture some of the images from my reading. I searched news articles and photos of mujahideen and sketched one of the members of a group photo. 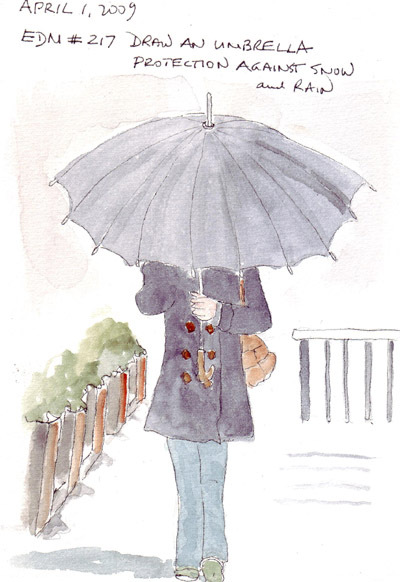 On the second day I searched for photos of women walking in the streets in their burqas and painted one of them. As I post these, the US is increasing the number of troops in Afghanistan and I can't imagine what the next phase of life is going to be like for these people, especially the women. 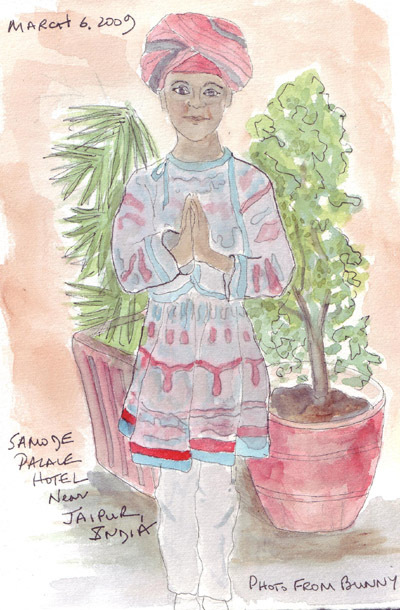 I'm still enjoying my friend Bunny's photos from her recent trip to India and using them for inspiration for my figure drawing practice at least weekly. Here are 3 more paintings. In the first one, it appears as if this young boy was posing for a single photo. The second one appears to be a market. 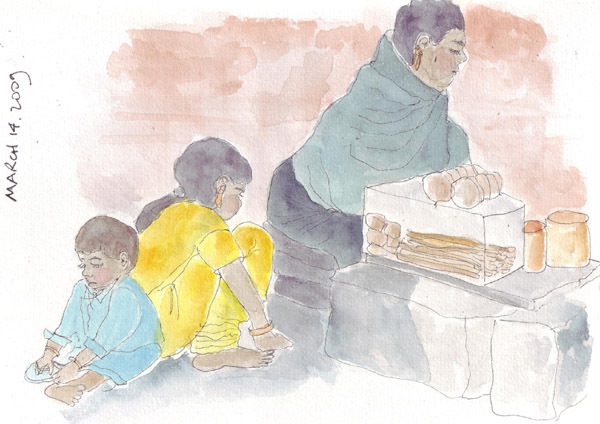 The vendor has two children playing on the ground next to her. The 3rd is one figure from a group photo. I was very drawn to this image as I was in the middle of rereading Khalid Hosseini's second book A Thousand Splendid Suns and the two women in the story were in burqas whenever they left their home. 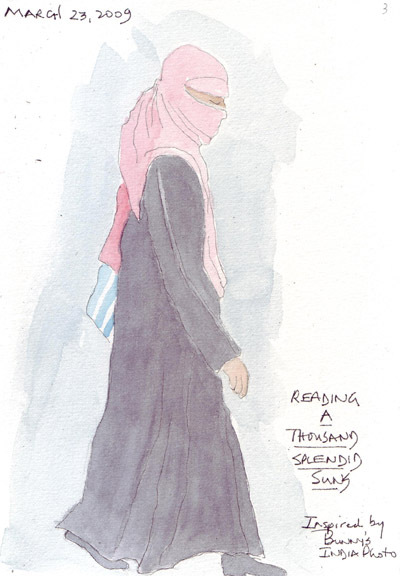 Although this is not a classic burqa, I was drawn to this figure walking along the street and just had to draw and paint her image. 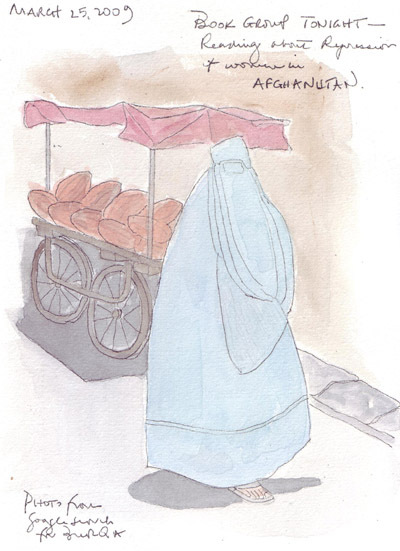 Next week - mujahideen and women in blue burqas from Afghani photos I'm collecting from the web. 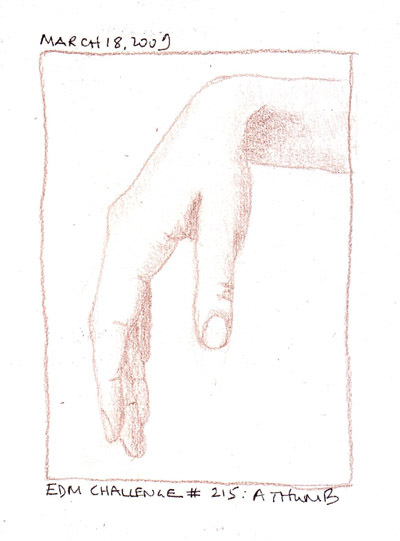 I need hand drawing practice so much, that I did two drawings of hands with thumbs. But I found myself smiling much of the time, remembering that my 4 year old grand daughter Sydney called them "flums" not very long ago. We all took every opportunity we could to have her say it, especially her 5 year old brother Henry who thought it was adorable because she was so earnest.